Have you recently stayed at a luxury hotel using one of DOWNLITE's hotel down pillows? If you have, or you just want to find the down pillow that's perfect for you, we have your solution. 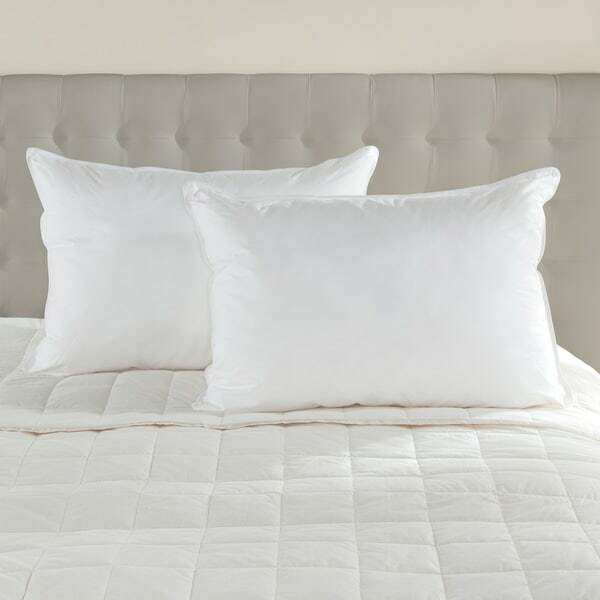 Featuring our hypoallergenic 600 fill power white goose down, this soft density pillow is great for stomach sleepers. 600 Fill Power White Goose Down 230 Thread Count Cambric Cotton Soft Density - Perfect for Stomach Sleepers Easy Care: Machine Washable & Dryable Shell Made in China. Filled and Finished in the USA of Imported Materials Sizes & Weights: Standard Size- 20 x 26 - Soft 12 Oz. Queen 20 x 30 - Soft 13 Oz King Size - 20 x 36 - Soft 17 Oz. My husband loves this pillow. He sleeps on his stomach and most pillows cause his neck to hurt in the morning. He’s been using this pillow for a week and hasn’t had any neck issues. LOVE THESE! I liked them so much that I plan on ordering more of them! I ordered them for my RV but I'm going to get some for the house as well! Super comfy! First of all, I would recommend this to a friend. I had just ordered a set of pillows that were soft to medium and for me they were too hard( had to return)... so I tried this soft pillow and it is a winner... Usually I have to break in a pillow - this one it is wonderful and I'm loving it .. it is soft and melts down well to my comfort. Traveling to multiple hotels across the United States has repeatedly led me to experience the wonder of hotel room pillows! They are always so comfortable and soft, I never want to leave the bed. With that said, when I saw these online, just had to have them!! I bought the pillow for my daughter as she is a stomach sleeper and was in need of a new pillow. She loves it and says she sleeps like a baby with it. I like a soft pillow, but unfortunately, this pillow was way too soft. I'm small and don't weigh too much, but my head went right down to the mattress. There was no loft at all. I previously purchased the Downlite lightweight down blanket and love it, so expected I'd feel the same about their pillow. Not only disappointed that I had to return it, but not happy that I had to pay return shipping. This pillow does not have enough filling in it for the size. I returned it and the return shipping cost me ***. But I dont like the pillow so it is going back. Love these ! Great for side sleepers as well! They are very soft but ended up getting a little firmer pillows as it seemed like we were folding pillow at night in half to get more support. "It’s not clear. Do you receive 1 or 2 pillows?" This listing is for a single pillow.